This college football betting weekend, the best sportsbook online players in the nation can wager on a thrilling matchup between two nationally ranked opponents. No. 2 Oklahoma will be playing host to No. 10 TCU. The Sooners will be looking to solidify their position in this year’s college football playoffs while the Horned Frogs will be looking to see if they can leap, quite literally, themselves into a postseason seeding. It’s an enticing matchup to say the least and it offers one heck of a betting opportunity. Let’s take a look at the action sportsbooks for US players are putting together for this Saturday’s Big 12 Championship game. The TCU Horned Frogs enter this Week 14 matchup flashing a 10-2 record that ranks them 2nd in the Big 12 rankings thanks to the 7-2 record the franchise has posted in conference play this season. The Horned Frogs two losses of the season have come against the then-ranked No. 25 Iowa State Cyclones and a 38-20 loss to No. 2 Oklahoma earlier this season. But since the Horned Frogs managed to go undefeated against everyone else in the conference, they’re the only program who has been able to rise up and challenge the Sooners. Most NCAA betting pundits would agree that TCU has gotten much better since they lost decisively against Oklahoma and the best sportsbook online odds reflect that. Looking over both team’s stats, it’s clear that the Horned Frogs are the ones facing the disadvantage. 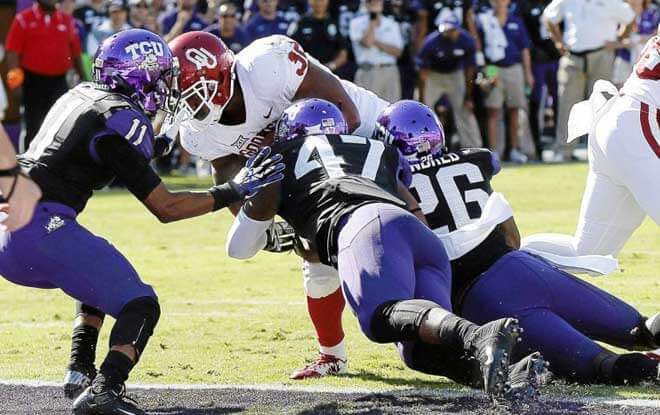 TCU is averaging 34.5 points per game while the Sooners are putting up a whopping 45.3. However, on the defensive side of the ball, the Horned Frogs have a clear advantage as well. TCU is allotting an average of 15.7 points per matchup while the Sooners are giving up 25.7 themselves. Looking over both differences on offense and defense, the slight deviations tend to cancel themselves out. TCU certainly has a chip on their shoulder after the defeat they suffered earlier this year. Maybe they can ride that chip to an upset win over the 2nd best program in the nation. The Oklahoma Sooners enter this championship pairing filled to the brim with confidence that they can get the job done once more. The Sooners are 11-1 so far this season with their only loss coming against Iowa State, which is interesting considering TCU lost to them as well. The Cyclones were unranked when the Sooners suffered that loss and is unranked once more heading into this weekend’s action. This doesn’t bode well for either team but the Sooners should punch their ticket to the playoffs with a win this weekend. Oklahoma enters this game riding a 7 game win streak that stretches back all the way to that loss against the Cyclones. The neutral site that this championship game will be played at tends to favor both sides, as the short trip and local communities practically gives both competitors home field advantage this weekend. That said, the best sportsbook online bettors on the planet might want to consider backing the Horned Frogs on the spread. Most bookies have the spread set at 7 or 7 ½ and are offering anywhere from 105-110.